Earlier last year, I had a different method of single needling my stretch marks. It was quick and appeared to work. Unfortunately, I wasn’t paying attention to the damages (minor, but accumulated after a few sessions). So, once I began my single needle sessions again, I decided not to do my technique. Instead I use Sarah’s instructions; it’s extremely time consuming I have a ton of stretch marks) but I feel that this is a safer way without adding more damage. 1.My breast and some small spots on legs have hyper-pigmentation on every area that I have derma-rolling since 12/24/12. I was hoping that it was temporary, but there is still a noticeable dark area. I don’t think it is because I rolled to hard because I don’t press hard (derma-rolling is painful). Since the skin is thinner on the breast, could it be the 1.5 mm roller (I’ve used this before without issue though)? 2.Unlike my own technique, I get a lot of bruising, which I read to be a good thing, from single needling. The bruising (deep blue-black bruising in some areas) last at least 14 days, which I thought was a little odd, but I do bruise easily even with a skin type of Fitzpatrick V. Is that normal? 3.Also, I had an accident which caused several scars, but 1 would not heal seamlessly into my skin. Since it was on a spot on my knee that kept bending, the sore kept opening, so it took a longer time to heal. It ended up a hypertrophic scar. 4 months after the scar I decided to place a silicone sheet on it to flatten it in October. Then, when I began singled needling sessions, I would prick it from time to time (derma-rolling hurt to bad). Have I read correctly that single needling will help flatten the scar (note: I have gotten the scar almost completely flat)? 4.Also, the scar of my knee is rough (extremely dry and thicken skin). I can pick at the scar and flakes of skin with come off. What do you think that is? How can I improve that area? Thanks in advance for answering. For ease of reading, my questions are in bold. 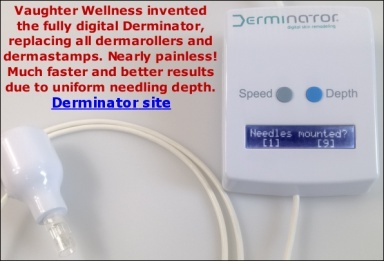 Using a 1.5 mm dermastamp may be quicker way of needling stretch marks if you have very many. It is less targeted but still very effective. It would be interesting to know what your technique is. Bruising is not harmful but if you get it a lot of brusising, the needle length is too long for you or for that area. Instead of a 2 mm single needle, use a 1.5 mm dermastamp. >flakes of skin with come off. What do you think that is? How can I improve that area? Using a 1.5 mm dermastamp is perhaps better for this type of thick scar. You should constantly moisturize it with a semi occlusive cream such as Infadolan or even an occlusive cream such as Vaseline.